GSSAP (Geosynchronous Space Situational Awareness Program) or Hornet is a series of space surveillance satellites developed covertly by the Air Force and Orbital Sciences to provide a space-based capability operating in the near-geosynchronous orbit regime supporting U.S. Strategic Command space surveillance operations as a dedicated Space Surveillance Network (SSN) sensor. Accourding to USAF officials, the GSSAP satellites will drift above and below the GEO belt, using electro-optical sensors to collect information on satellites and other objects in that region. The satellites are maneuverable, allowing them to collect intelligence on specific target satellites. 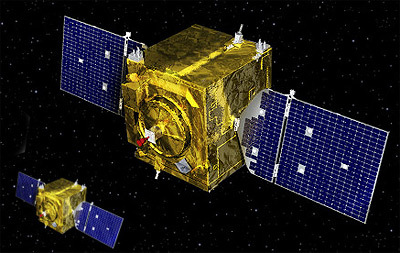 GSSAP provides “accurate tracking and characterization” of satellites. The first pair of GSSAP spacecraft was launched in 2014 from Cape Canaveral on board of a Delta-4M+(4,2) rocket with another pair to follow in 2016. A third pair will be launched in 2020.